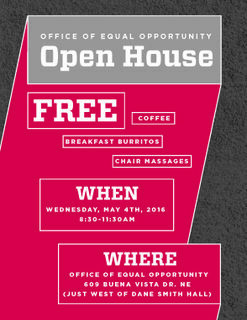 The UNM Office of Equal Opportunity hosts an open house on Wednesday, May 4 from 8:30 a.m. to 11:30 a.m. at their office at 609 Buena Vista Dr. NE. The campus community is invited to stop for free coffee, breakfast burritos, chair massages and information about the OEO. OEO Open House set for Wednesday, May 4. "This event is an opportunity for students to familiarize themselves with the OEO office and learn about their rights under Title IX and how to file a complaint at UNM," said Francie Cordova, director, Office of Equal Opportunity. “We want people from all across UNM to feel comfortable coming to OEO when they have a concern or want to file a report and you feel more comfortable going someplace you’ve been before,” said Title IX Coordinator Heather Cowan. 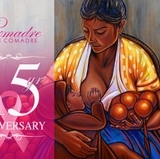 For more information visit OEO online or call their office at (505) 277-5251.